A treasury of traditional fairytales such as 'The Princess and the Pea', 'The Twelve Dancing Princesses' and 'Rapunzel', alongside brand new stories about mermaids, fairies, princesses and dolls. This book is sure to be revisited time and time again, as little children will enjoy listening to the tales read aloud to them, and then want to read them on their own as they get older. 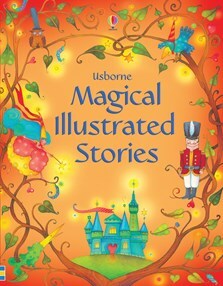 A charming collection that is beautifully illustrated in full colour and with a hardback cover. The nights are drawing in and this is a perfect book for winter bedtime reading... With bright, attractive illustrations that nicely match the different stories, this is a collection that will give a great deal of pleasure.